If you work in finance, your printer may have recently spewed out a bizarre warning about the future of your industry. The warning, which took the form of a glitchy-looking letter conveyed the warning that 94 percent of finance professionals could be replaced by AI by 2024. It’s been sent to over 623,000 printers with publicly-accessible ports, according to its creators — an ambitious piece of futuristic protest art for the era of automation. The project, called Beware of Bots, is the brainchild of Vlad Sitnikov, the same guy who told Futurism he wanted to launch giant billboards into space. This time, his advertising has gone hyperlocal — in the philosophical opposite of that annoying “learn to code” movement, he urges people to pivot to graphic design and other creative fields that artificial intelligence is less likely to automate. Sitnikov could stand to profit from the hack: the letter he sent to thousands of hacked printers contains a coupon for a design course by author Michael Janda, with whom Sitnikov collaborated, and he was working on behalf of Skillbox, the online learning platform hosting Janda’s courses. To reach the finance bros’ printers, Sitnikov built a bot that accessed what’s called port 9100, through which many printers send and receive data. It’s not uncommon for hackers to exploit these publicly-accessible ports, so the hack itself isn’t all that revolutionary. 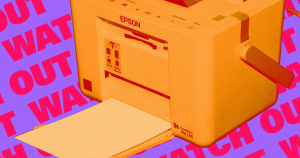 Accessing internet-connected printers by exploiting port 9100 is technically illegal, though most exploits tend to be harmless pranks. However,others have previously exploited port 9100 to commit hate crimes or send spam. What is new, however, is using the vulnerability for a viral marketing campaign. While this ad comes under the guise of benevolence, Sitnikov’s campaign could open the doors to all sorts of advertisements churning out of your printer. The post This Guy is Hacking Printers to Warn About Job-Stealing AI appeared first on Futurism.